Inclination – angle in radians or degrees a 2D line makes with the positive x-axis, measuring counter-clockwise. A line extends indefinitely in both directions. Slope – tangent of the inclination, y/x, rise over run. 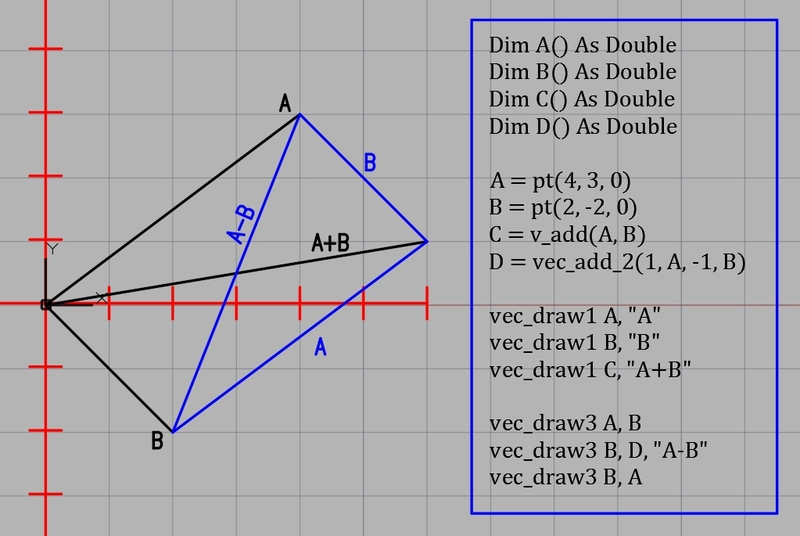 A 3D line, a 3D vector, is determined by any two points. If one of these points is the origin, the coordinates of every point on the line form a set of direction numbers. Every line has an infinite set of direction numbers. The numbers always have the same proportions. You can get the coordinates of any point by multiplying the coordinates of some other point by some constant. The direction angles of a 3D line are defined to be the angle the line makes directly with each of the positive axes. Knowing any two the third can be calculated. The angles are limited to 0 to 180, similar to the 2D inclination, but not limited to being counter-clockwise. The basic calculation of 3D line direction is the division of the direction numbers by the length between the two points that generated that set. This gives the direction cosines, the x,y and z values for a line of length one. Multiplying the direction cosines by a constant gives a point on the same line at distance of the constant. The 3 direction angles of the line can be found with the Cos(-1) function. For instance a line from the origin to (3,4,5) has a length of 7.07. The direction cosines are 3/7.07, 4/7.07, 5/7.07), the angle of the line to each of the axes, xyz, by calculator cos(-1), is approx 65, 55, and 45 degrees. Lets check that out with autocad and VBA. ucs ptX, ptx2, A, "ucs_alpha"
ucs ptY, pty2, A, "ucs_beta"
ucs ptZ, ptz2, A, "ucs_gamma"
Debug.Print "< " & x; ", " & y & ", " & z & " >"
Call the autocad dimangular method. First the ucs is changed for each of the 3 angles. UCS requires 3 points. 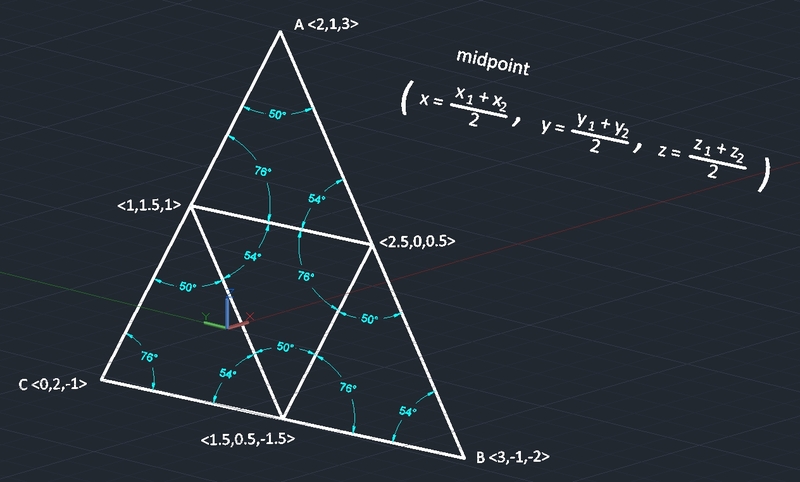 a new origin, a point on the new x-axis, and a point on the new y-axis. the origin is variously either (x,0,0), (0,y,0), or (0,0,z), the point on the new x-axis is variously (x+1,0,0), (0,y+1,0) or (0,0,z+1). the point on the new y-axis is always the point of the vector. that establishes a right triangle in the plane of the vector and the axis to which the angular dimension is drawn. 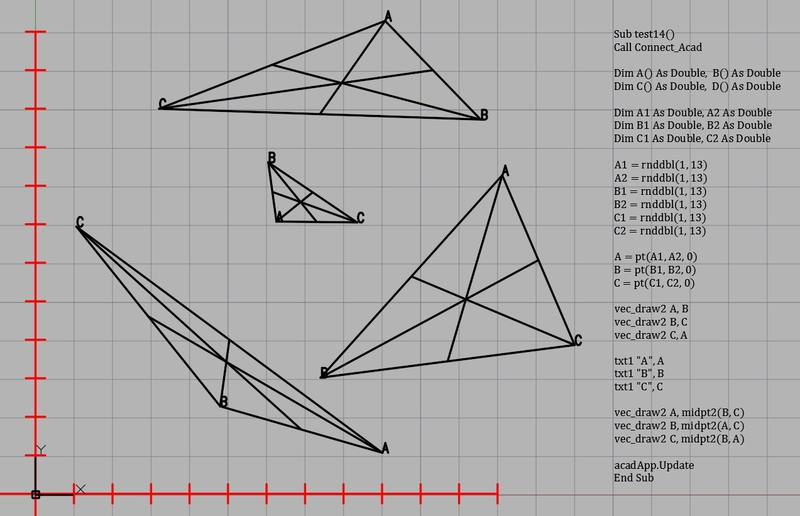 Independently of the autocad dimangular method, the direction cosines and direction angles are calculated. Since these are always triples, the most convenient way to store them is in a 3 place array of doubles, exactly as point coordinates are stored. In fact the direction cosines are the point coordinates for any line at the point where the length of the line is one. Both direction cosines and direction angles are calculated for a vector with tail at the origin. The version to calculate with tail not at the origin would simply do the subtraction of coordinates then call this version. testing the subroutine for values in all 8 quadrants. the angles are always measured to the positive side of the axis. therefore they are always between 0 and 180, never negative. Getting the confidence that all quadrants return true values, the next step is to develop a sub-routine that returns the angle between two lines. str = "<" & x & "," & y & "," & z & ">"
Acad3DSolid box sub. Transparency is a percentage 1 to 90. Higher numbers are more transparent. the triangles are all congruent. the middle triangle has half the perimeter of the outer triangle and one fourth the area. it would be possible to do this on one line but it would be hard to read. 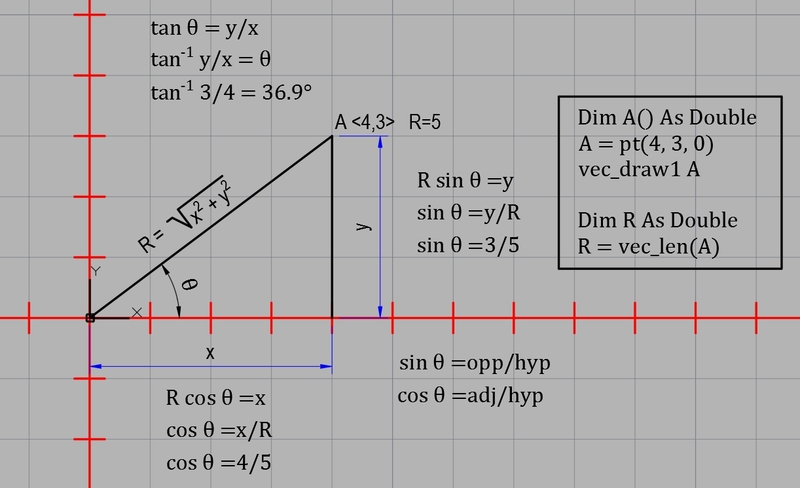 The angle of a 2D vector is a directed line measured from the positive X axis. It takes a value between 0 and 360 degrees not including 360 or 0 and 2 pi not including 2 pi. The inverse tangent is used with y/x as argument. 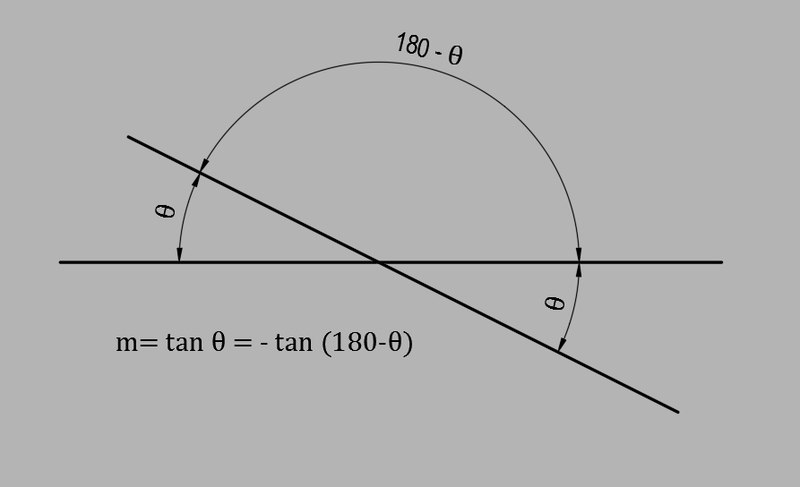 Tangent returns an angle for an undirected line between -90 to +90 or -pi/2 to +pi/2. The code is a bit tedious but its pretty straightforward. We have to trap out zero values of x, to avoid divide by zero, then check for zeros of y and interpret, then retrieve the value for the inverse tangent and interpret according to which quadrant the head of the vector is in. A straight line is completely determined by the coordinates of its endpoints. A straight line having a definite length and direction but no definite location in space is a vector. In its most basic form its a single point. 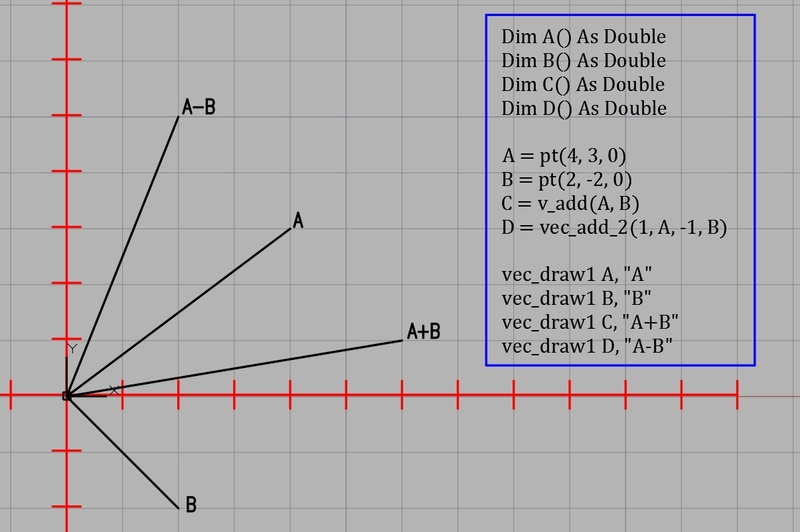 A vector and a point are both a 3-array of doubles. Make them a dynamic array. The functions to calculate direction, midpt, cosines, addition and scalar multiplication of vectors all return an array of 3 doubles. The line subroutines work with arrays of 3 doubles. Where I have one point argument, assuming 0,0,0 for the other, I number the routine_1. Where I have two point arguments, I number the routine_2. Passing and assigning points cleans up the code to almost logo like clarity. 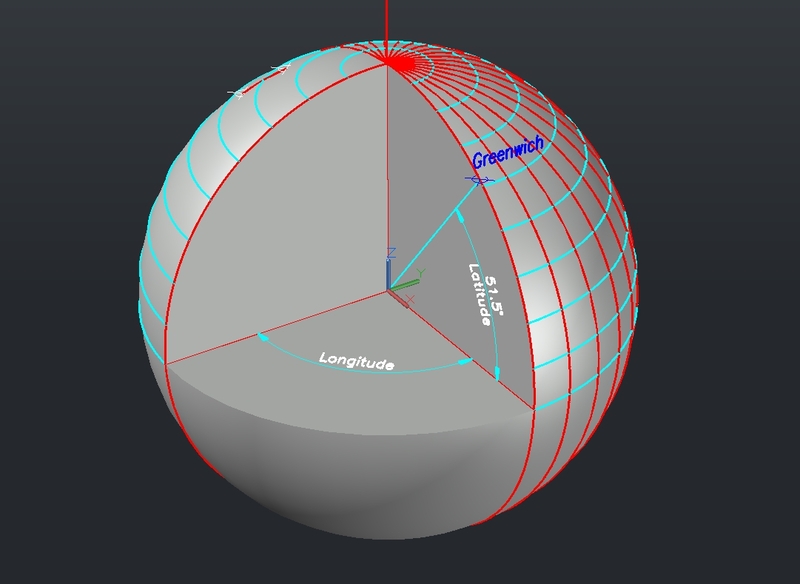 Autocad does not have a 3D arc command and its kind of wild how hard it is to draw an arc on a sphere. I think we can do it, but there is a lot of theory involved, which is good because its fun and what else were you going to do? Googling the problem, the best solution I saw (which i won’t use here) was “ProjectGeometry” where a line drawn from point to point on the sphere is projected onto the solid sphere object and converted to an arc. I did not spend a lot of time looking for it, but I am not sure if that method is available in activeX. Its not an object type. Its a command, a written program in autocad, so its a manual technique. Although possibly you could use sendcommand or something similar. To draw an arc on a sphere – two endpoints, center and radius will be the givens. Two vectors from 0,0,0 to the endpoints are drawn. The dot product, also called the scalar product of two vectors, has all the theory we need to construct a new ucs in the plane of the vectors and the arc we want to draw. Its a math topic in a beginning vectors class. The dot product is a calculation that projects a perpendicular from one vector to the other. The point that it touches becomes the origin of the new ucs. The new x-axis is defined by the endpoint of the vector, and the new y-axis is defined by the projecting vector endpoint. The 3 points must form a right angle, which they do. The dot product also gives us the included angle between the vectors, just from the endpoint coordinates. very nice. There is no way to draw an arc that is not parallel to the current ucs, so you have to change the ucs. However all the other data that goes into creating an arc stays tied to the World ucs, as far as drawing in activeX is concerned. 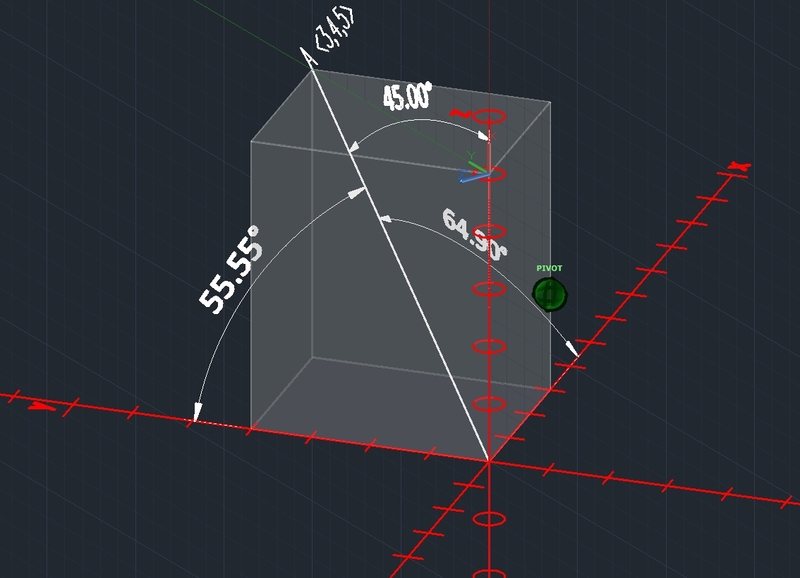 If you are drawing manually, autocad accomodates your desire to draw in the new ucs. 0,0,0 typed in at the command line is interpreted to be the new ucs origin. Activex generally ignores the ucs, except as it defines the drawing plane. Draw an arc with any method then look at the arc in the properties window to see what data is read/write and what is grayed out. 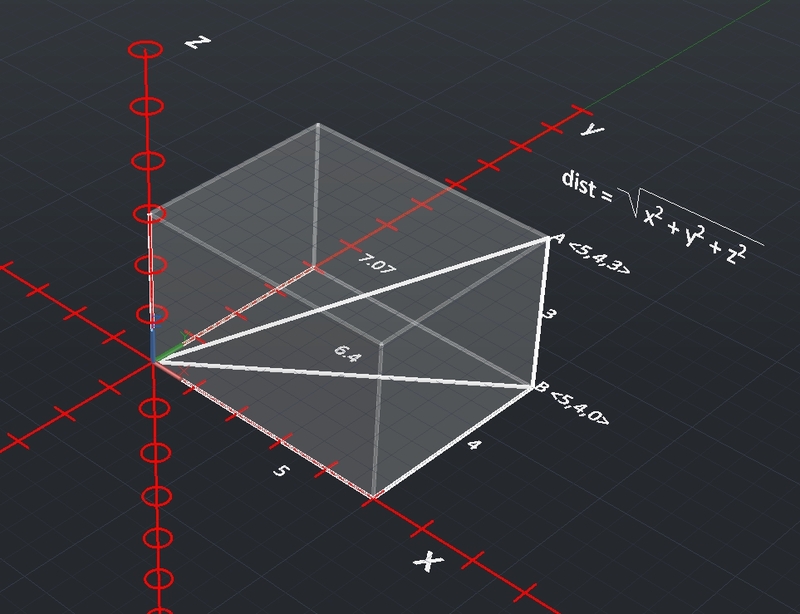 You can edit the center xyz coordinates, the radius, the start and end angle. Thats all. Those are the exact same prompts the activex addarc requires. Moving the center moves it parallel to its plane of creation. 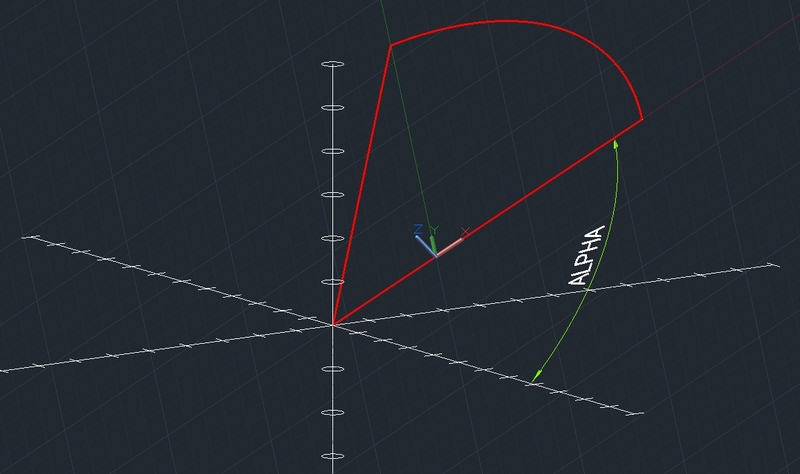 If the other data are changed, the shape of the curve is changed and new endpoints are calculated by autocad, but it stays parallel to the plane it was made in. Startangle is a hard problem. 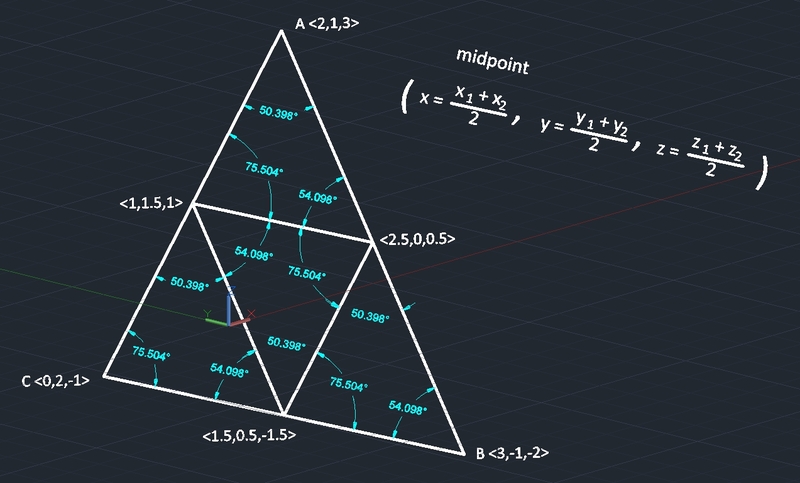 With the dot product, we can calculate the included angle from the endpoints. We know the center and the radius. The startangle for the arc is not the angle from the current ucs. It is not the angle projected onto the world ucs. 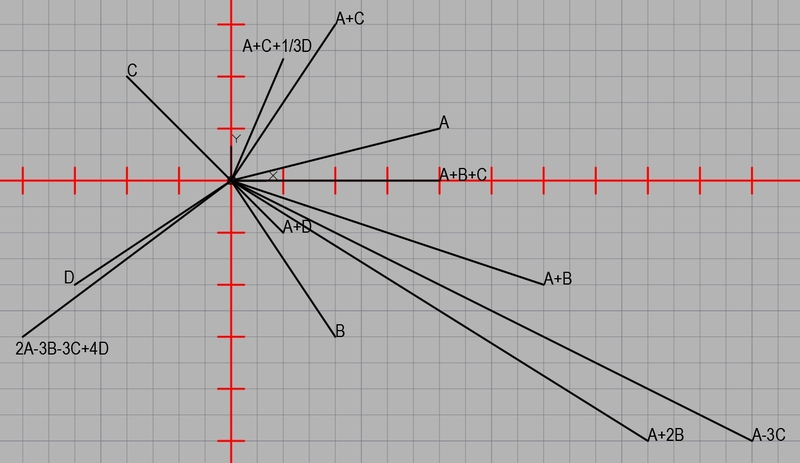 With 2D vectors, there is only one reference angle, the angle from the vector to the positive X axis. 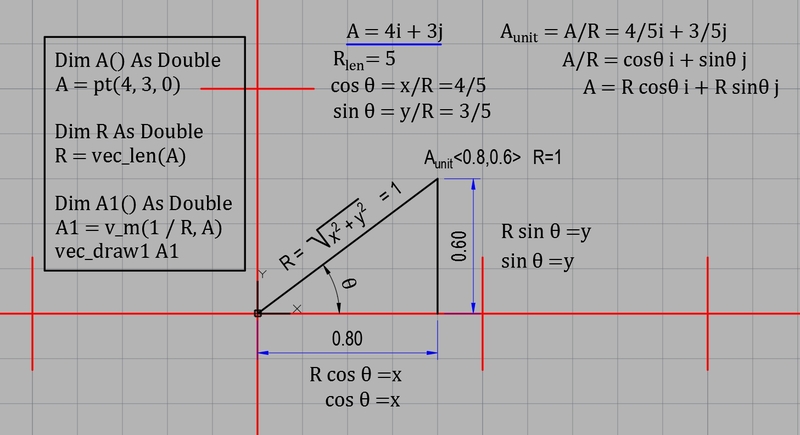 In the 2D plane autocad measures angles from the positive x-axis. The angle of a 3D vector is defined by the angle from the vector directly to each positive axis. The angle to the X-axis is called the Alpha angle. In the tilted ucs I did not see what the logic of startangle was. I drew an arc with startangle zero, and the arc touched down on the world x-axis. The startangle is the vector direction angle Alpha from the new x-axis directly to the world x-axis. But it is not that simple either. My vectors were 5,5,5 and -5,5,5. They were symmetrical across the z-axis, which made an alpha projection hit the x-axis. If the ucs has another twist, the alpha angle will extend to where it breaks the xy plane apparently. I need to find the intersection of the ucs with the world xy plane. The only way i know how to do it right now is to draw an arc with startangle 0 and see where it starts. Pretty sure its a solvable problem. ucs pt_scalar_B_on_A, ptA, ptB, "wow"
set_ucs 0, 0, 0, 1, 0, 0, 0, 1, 0, "world"
My goal is to draw on the sphere converting latitude longitude coordinates to xyz values. Once coordinates are calculated, every line on a sphere is an arc. To draw an arc with known endpoints, known radius and known center, you would think would be simple, but consider what if the points are inaccurate and an arc cannot be drawn. That is why the AddArc method requires a Center, a Radius, a Start Angle and an End Angle. It calculates the points. But notice, there is no opportunity to tilt the arc up into 3D space. It will lie in the XY plane. 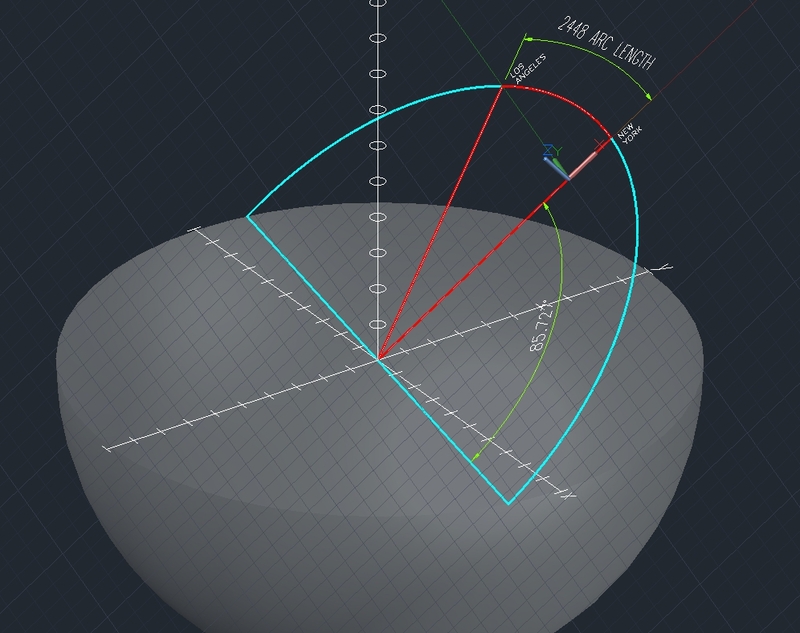 To draw an arc on a sphere from a center, a radius and two known points, a user coordinate system must be created containing the 3 points, and the angle between points has to be calculated. A UCS point set requires three points that form a right angle. the origin, one of the endpoints, and a normal point. There might be another problem – methods from VBA (ActiveX) generally ignore user coordinate systems and work only in World coordinate system, Autocad’s base of operation. However the help for addarc mentions the center is in WCS, but not the angles. I assume the angles are calculated from UCS. (update a few days later – they are not). 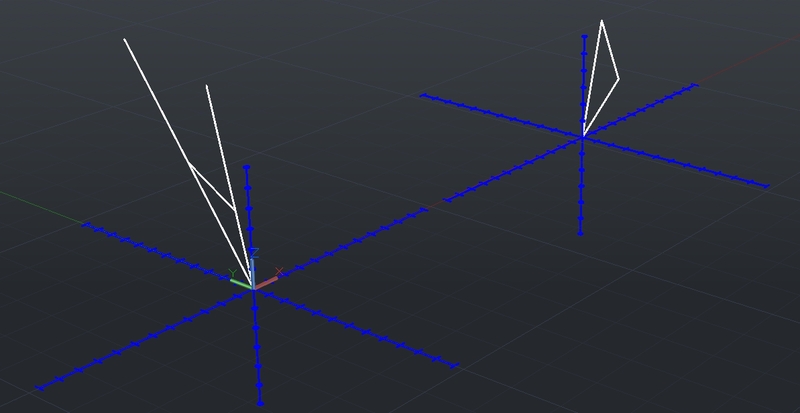 Then the angle between points would be calculated from the X axis of the user coordinate system. I have not tried it yet. Generally if an ActiveX method requires a point, its a WCS point. AddLine is a fully functional 3D command. It takes two 3D points as input. It does not matter what UCS is current. It ignores it. If VBA has the point 0,0,0 as the first point of a line, it starts the line at WCS 0,0,0 no matter where the origin is for the current UCS. That is not so at the command line, 0,0,0 typed at the command line to the line prompt is interpreted to be the origin of the current UCS. Circle is a little different. you can draw circles at different Z elevations without changing the UCS from the command line, because the center can be any 3D point. You can do the same from VBA, but subsequent prompts and input do not allow you to tip the circle so that it is not parallel to the current UCS. we need to survey our basic tools and see how they act and what they require. we need some ucs tools and some viewpoint tools. viewpoint is somewhat more involved than ucs. it has more variables and finally whatever view is created has to be applied to the current viewport. for now i am going to rely on some simple macros and my 3Dconnexion mouse, which works great, the simple one. The old viewpoint command, before the dialog box, just took a direction vector. such as “1,-1,1” for a southeast viepoint. We can throw that into a program quick if we need it. mostly i will probably rely on the mouse. but here is the macro sub using sendcommand. if you type VP at the command line and get the dialog, type -VP. if that doesnt work look at your pgp which is re-directing. this code works if -vp works at your command line. next we need to survey our basic tools, line, circle, arc, polyline, and ucs with regard to how they work in 3D space. we will need some text labels, we will want to dimension in 3D. we can download the formulas to convert from latitude longitude to cartesian but we want to show how they are developed. The diameter of the earth is not constant. People who map for a living know exactly what the bulge is. we are going to assume a perfect sphere, but we will use a variable for the Radius so results will be general for a bowling ball or the earth. once we have the autocad tools, we should be able to download some coordinates into excel and draw arcs between them from vba. assuming i can draw 3D arcs. Years ago an electrical engineer stopped by my desk, leaned over the partition and said, I want you to automate my ladder diagrams. I want to push a button and the drawing comes out. He had seen what we had done, what others had done, with an automated program that spit out a family of parts that were going down our only area of the plant with a production line. I answered him that I could not write that program, which he interpreted I would not write the program. You don’t know how much time that button would save me, he said. In my only perfect response in this lifetime I said, you don’t know how long it would take me to write that button. Our successful automation program had all the necessary ingredients. The product line had existed a long time. It had sold a lot. The variations in the family of parts were considerable but considering the volume and the number of times they had been reproduced, a system had developed to name and describe them. The product line had several smart people good with computers working in that area for a long time. High volume, good people doing it manual for a long time, discrete number of variations. That is what you must have to automate – a manual system. The first step to automation, besides an actual product, is a five minute refresher, or introduction, to databases, specifically table relationships, and specifically what is a key field, and what is a foreign key. This is how data is stored. This is how the product is described. MS Access used to be a useful tool, but version changes, file version problems, 32-64 bit problems, getting it funded, being replaced by the big do-all database, all these caused it to drop in my work environment. But the principles of product structure, a main table and parts tables connected by relations, are applied in excel. I will come back to this. This is a large topic not really suited to the blog format. I need to think up a sample project. It will be math related, not with obvious commercial applications.